HYGIENA says as well as providing a rapid and convenient test for the detection of gluten residues on food processing surfaces, its AllerFlow Gluten is equally effective at detecting gluten in liquid samples, making it ideal for final rinse water samples and this means that the simplicity and convenience of AllerFlow Gluten can be applied to both surfaces and liquid samples and a wider range of food and beverage manufacturers. The company says AllerFlow Gluten is a rapid and convenient test for the detection of gluten as part of an allergen monitoring program, it is specific to the gliadin R12 allergenic fraction found in wheat, barley and rye, with no cross reactivity with soy, rice or corn. 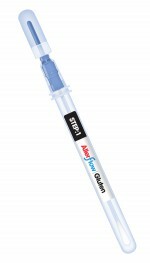 Unlike many commercial multi-component tests, AllerFlow is said to make gluten testing easier than ever before, due to the combination of Hygiena’s patented snap valve technology for convenient sample collection devices and classical lateral flow technology - simply swab, snap and pour the fluid into the sample fill aperture on the cassette. Hygiena says the result is seen in 10 minutes where a pass is indicated when a single blue line appears at ‘C’ (control), which means that the sample contains less than 5µg (5ppm) gluten. If the samples indicate greater than 5ppm gluten, then a red line will appear on the cassette indicating a fail and the more intense the colour, the more gluten is present.